International Space Station Astronaut Scott Kelly proudly shared photos of the crew’s first home-grown flowers this weekend. 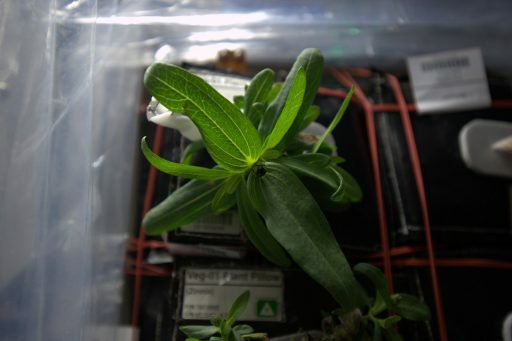 The zinnia blossomed aboard ISS as part of an experiment deployed on the orbiting laboratory to demonstrate different types of plants can be grown in the space environment – a necessity for future missions going beyond Earth orbit. 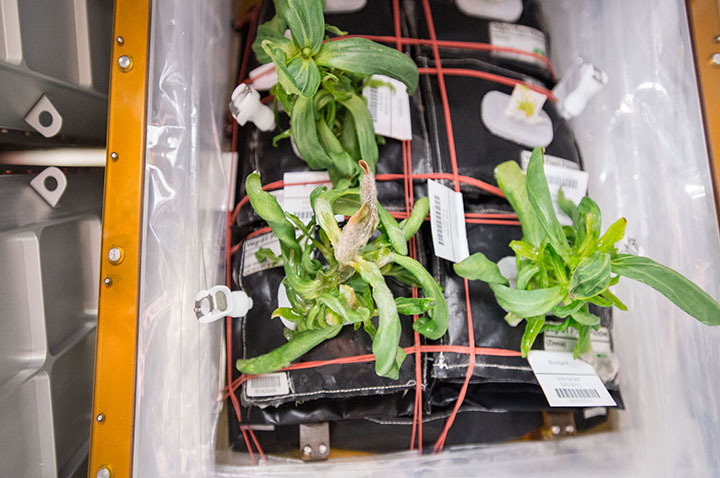 The VEG-01 experiment was delivered to the Space Station in 2014 and includes a plant-growth unit capable of facilitating multiple plant pillows and providing lighting and nutrient supply. 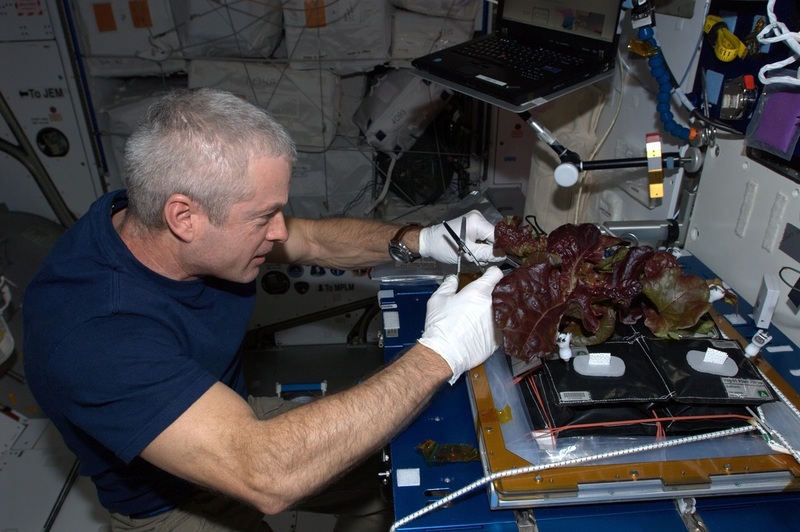 A first round of experiment operations concluded in June 2014 when the Expedition 40 crew could harvest their home-grown red romaine lettuce. However, the crew was only allowed to collect samples and ship them back to Earth as assessments had to be conducted on whether it was safe for the crew to consume the lettuce with respect to potential bacteria or mold build-up. The next VEG-01 operation came during Expedition 44 when the facility was again used to grow lettuce plants. For the crew, experiment activities include daily photographing of the plants, thinning out of plants and regular water injection into the special plant pillows. 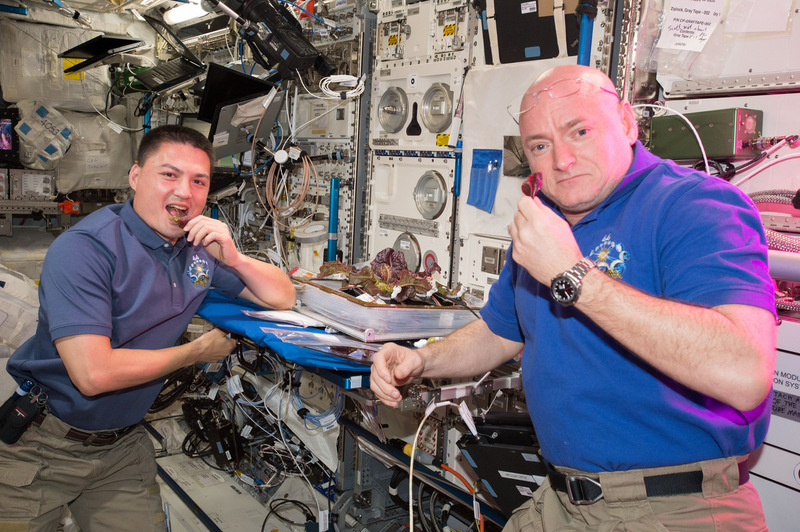 After harvesting the plants, the crew was able to enjoy a taste of food grown, harvested and eaten in space – a critical step for missions to distant targets. 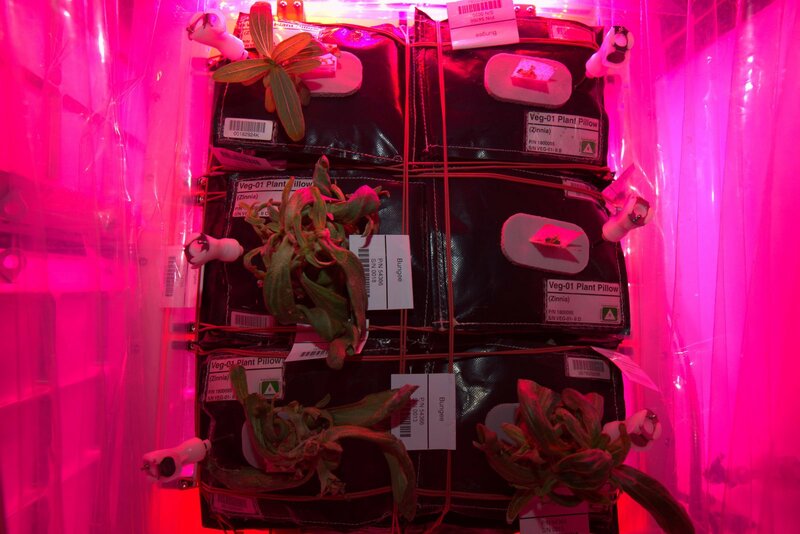 The first two runs delivered a wealth of data for the improvement of autonomous gardening in space, especially with respect to watering procedures as multiple plants in these experiments were lost due to drought stress. For the next run of VEG-01, scientists picked a different plant to demonstrate the functionality of the facility for a variety of specimens. Zinnias were grown for about two months to help scientists understand how plants flower and grow in space. Very different from the lettuce, zinnias are more sensitive to environmental parameters and require a longer growth duration, making it a more difficult plant to grow and actually flower. 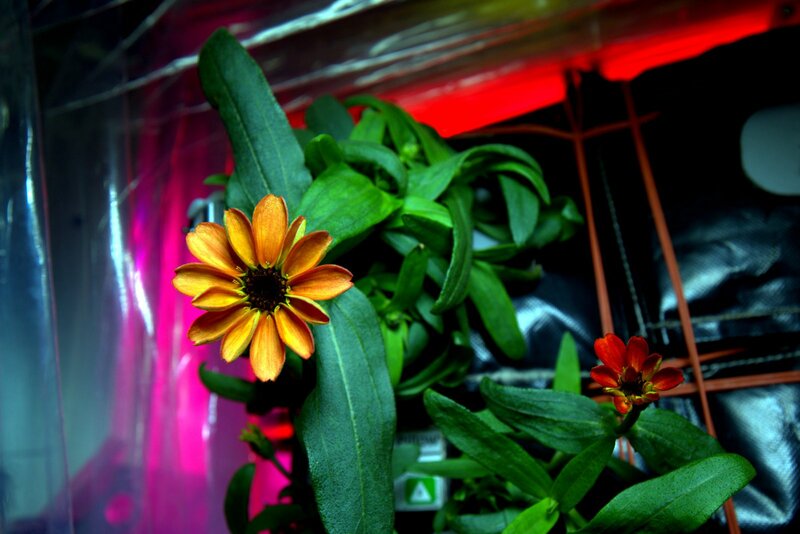 Zinnias were chosen as a precursor to tomato plants to be grown aboard ISS in the coming years. But the zinnia-growth run was not without trouble for the space gardeners aboard ISS. Within two weeks, the plants showed droplets of water on their leaves, forced out due to high internal pressure as a result of high humidity. Also, the leaves of the plants began to bend down and curl drastically, a known condition characterized by flooding in the roots. It was determined that these conditions were caused by inhibited air flow inside the plant growth facility as well as excess water in the plant pillows. Before the air flow problem could be addressed, some of the leaves died and mold started to form. Scott Kelly had to channel his inner Mark Watney, as he Tweeted in late December, and surgically remove the moldy plant parts and stow them in a laboratory freezer for return to Earth to be studied. He then wiped down the healthy plant parts with sanitizing wipes and the Veggie fan was turned to its high setting in the hopes of keeping the chamber dry to prevent further mold from building up. Kelly’s willingness to take responsibility of the plants was gladly accepted by the ground team in order to learn more about the ‘autonomous gardening’ aspect that would be a part of missions where communication delays limit the ground’s ability of providing real-time support. He was provided with a short-guide to the zinnia to help him understand the plant’s behavior. Though two plants were not able to recover from a combination of high humidity, excess water and mold, Kelly was able to nurse two plants back to life and a few buds began to sprout petals in early January. 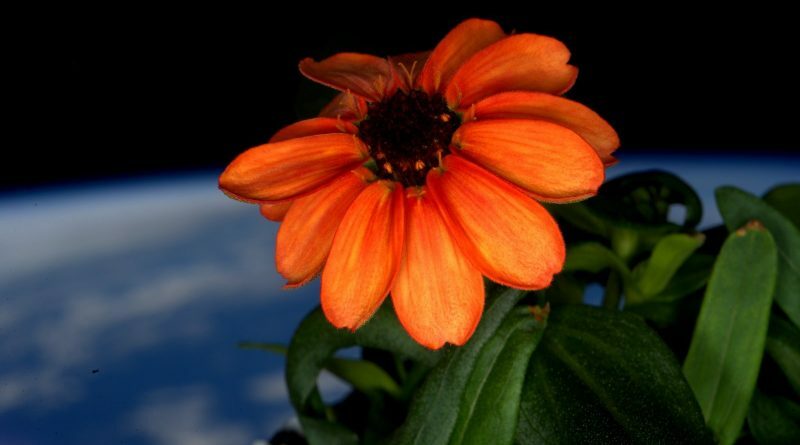 On Saturday, Kelly tweeted photos of his space-grown flowers. 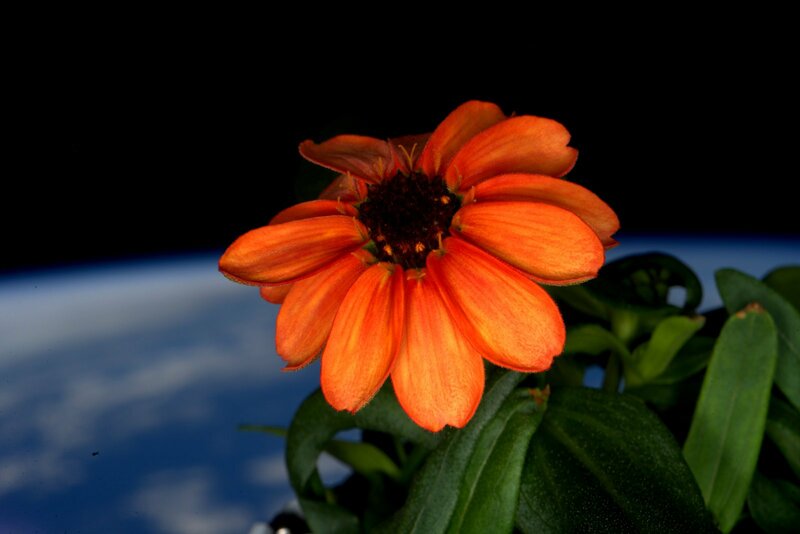 Another photo Tweeted on Sunday shows the zinnia in front of a Cupola window with a beautiful backdrop of Earth. This also showcases another aspect of the Veggie study as growing plants in the mostly artificial environment of space flight can have a positive effect on crew moral as a recreational activity with the added benefit of producing food for the crew. 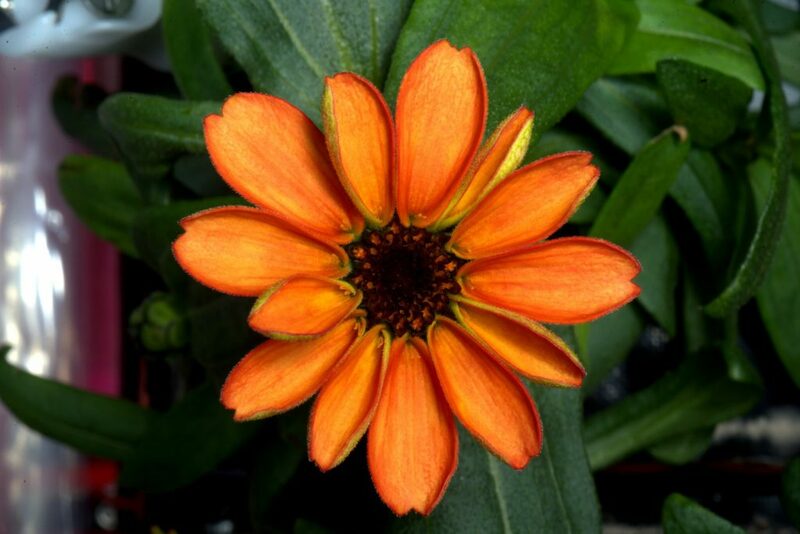 Although Kelly praised his zinnias to be the ‘first flower grown in space,’ this milestone has to be credited to the crew of the Salyut-7 space station where, in 1982, Arabidopsis (rockcress) were grown in a 40-day experiment that got the plants to flower and produce seeds. The study performed back then compared plants grown in centrifuges at 0.01, 0.1 and 1g as well as plants grown in the microgravity environment and found that, in the space environment, the stems of the plants (below the leaves) were elongated while the plant root length was reduced. Nevertheless, it was determined that about half the seeds collected from the space-grown plants were biologically valuable. Despite a number of challenges, the most recent run of plant-growth experiments on ISS had a happy end and brought some joy to the crew onboard and scientists on the ground, plus vast knowledge on how flowering plants behave in the space environment, valuable lessons for future space-gardening activities. Later in 2016, Veggie will be put to use to grow Chinese cabbage and red romaine lettuce to be delivered on the next Dragon flight to ISS. Further perfecting the growth environment inside the Veggie facility, teams aim to study different lighting conditions, varying the wavelengths and light intensity inside the chamber to optimize the mineral composition of plants. If everything goes according to plan, the Station crew may be able to grow their first tomatoes in 2018.